The Blue Wednesday fixture, for up-and-coming breeding bulls, the majority ready for work, along with breeding females, is again expected to create keen interest among pedigree, commercial, beef and dairy breeders. 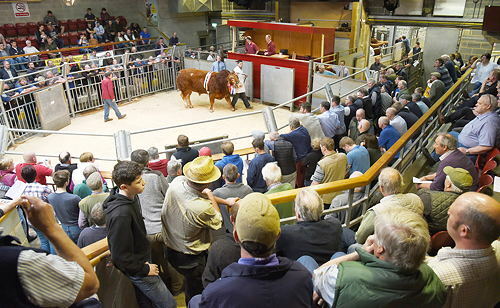 Also on the same day’s agenda is the usual prize sale for British Blue-sired store cattle, plus fortnightly sales of young feeding bulls, beef feeding cows and store and breeding cattle. Next up on Wednesday, May 8, is the fourth annual and increasingly popular Native Day fixture, with show classes for Aberdeen-Angus, Hereford and other native cattle, both pedigree and stores. The closing date for catalogue entries is Monday, April 22. A week later, the scene is set for the annual two-day early season Limousin showcase, on Tuesday and Wednesday, May 14 and 15, Skipton’s premier breed highlight. As in previous years, the afternoon on day one is set aside as for the Northern Limousin Extravaganza for 2018-born halter-led pedigree and cross-bred cattle, the majority having their first outing in the exhibition arena and benefiting significantly from the experience. This show-only fixture – judging begins at 2.30 - again offers an attractive prize fund, along with the annual stock judging competition. Catalogue entries need to be in by Monday, May 6. The afternoon also presents an ideal opportunity for pre-sale viewing of entries for Wednesday’s prestigious profile Craven Limousin Day, the annual Spring show and sale of pedigree Limousin bulls and females, which continues to grow in both reputation and status year on year. Catalogue entries close this coming Monday, April 15. Both days are again supported by the North East Limousin Breeders Club. The pedigree beef season concludes on Wednesday, May 29, with the Lingfields Beef Cattle Fair, the annual multi-breed show and sale of pedigree beef breeding cattle, with halter-led show classes for both bulls and females. Catalogue entries close on Monday, May 13. It is again complemented by the late Spring sale of bulling heifers, cows and heifers with calves, and in-calf cattle.